Travelling along on a foggy fall morning, the closest reference points are clear enough. But naturally, as you cast your eyes further ahead, the sharpness diminishes and the landmarks get less and less visible. It’s not unlike how one’s own life can feel at times. So perhaps it’s helpful to remember that as you move forward through the fog, those distant points that are eluding you right now will each, slowly and in turn, come into focus: one tree, one fence post, one morning at a time. 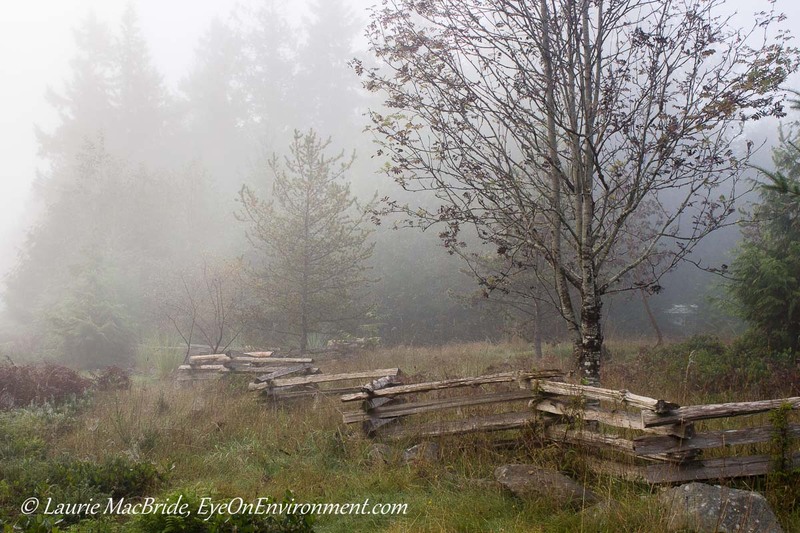 Posted by Laurie MacBride, Eye on Environment on November 25, 2013 in Musings on Life and tagged fall, focus, fog, Gabriola, inspiration, life, morning, photos. Thanks for the visit & comment! I was relieved to read the good news on your blog that you recovered your lost files. That’s good! And I’m going to be extra careful when carrying my laptop about or placing it down, thanks to your story. What a terrific piece Laurie, very moody and even a little ethereal! Thanks Toad! It was definitely an ethereal-feeling morning. Quite different from our current cold, clear and white view! Thanks so much for the comment on my blog…I love love this photo and your write up is so true. I always like fog. You’re most welcome, and thanks for your kind words on this photo, Nora! Thanks Phil! We had lots of fog last month, when I took this photo. It makes for some nice light and pretty landscapes. And it’s way less worrisome than fog when we’re out on our boat – at least on land you can see the edges of the road when you’re driving – whereas out on the water we sometimes see absolutely nothing! What atmosphere. I love that style of fence, every time I pass one on Pender I want to take a picture. Thanks, Deb. I agree, this type of fence is very appealing – even though it’s anything but deer-proof so not practical for our gardens! I think I have given up on deer proofing the full yard and just have the veggie beds protected. We have an additional challenge…raccoons. Our deer fence surrounds only the main garden – the rest of our yard is deer-friendly. We like it this way – they can walk right up beside the house if they want (which they often do), or explore what’s been added to our compost box since their last visit. We have raccoons too – they are a challenge in early fall when the grapes and kiwis are ripening! Wonderful image and I appreciate the life analogy. So true! Love how the fence recedes into the mist.